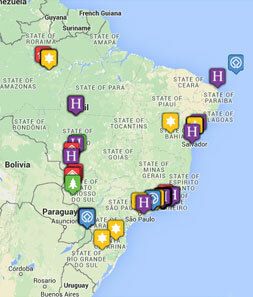 Tribes Overall: "All 4 planned location Rio, Atlantic Rain Forest, Pantanal & Iguassu were grand. A great holiday, well planned to cover our specific requirements. Thanks Paul "
Tribes Service: "Paul Cook fielded all our questions and ensured that we were aware of all the necessary information, etc. Amendments were provided when clarification was required and the whole trip when well." Guides: "Guides - Katia in Rio, Henry in Guapi Assu, Susan in the Pantanal & Edwardo at Iguassi. Were all great, good understandable English,good knowledge of their topics, helpful and considerate. Drivers were all helpful, considerate and drove safely, even in the congestion of Rio and Cuiaba rush hour." Social & Environmental Responsibility: "All the guides, drivers, accommodation staff were great in all locations visited. Re-forestation of the Atlantic Rainforest is a massive project which must improve both the environment and provide work for local people. Linking the wild spaces in the Pantanal, again should ensure that the habitat for wildlife is preserved and help prevent poaching / killing of endangered species. " Room was great, the open patio and \"honesty\" coffee, refreshments, bar etc. worked well. Breakfast was fine. Again the room was good, as was the food. The volunteer guide Henry escorted round the Wetland trail and provided excellent identification of birds. Unfortunately day 2 was a \"wash out\" and the planned trip was aborted. Great room, food pricey but excellent. We were upgraded to a new Jaguar Suite, which was excellent. Food was not special but was well cooked, presented and always enough. Crews on the launches ensured that sun-shades were erected when observing the resting Jaguars. Room 9 was adequate but the shower appeared to present a possible electric hazard, it didn\'t provide heated water - probably disconnected to ensure no lives were at risk. The whole shower area was in need of some TLC. A complaint to Susan< our guide ensured that on our return, room 5 was allotted and this room & shower were OK.
"The single day, whistle stop tour of Rio's major sites and attractions was fine. The excellent guide, Katia ensured that no time was wasted by using her guide pass and personal contacts to jump the long queues. We perhaps over extended ourselves trying to fit in the Botanicial Gardens "
"Regua & Guapi Assu Bird Lodge was fine, needed more time there (one day was a wash out) to appreciate the birds and what was being achieved. 5 different Jaguars were seen in the Pantanal, and at least 2 were seen on all but one of the 6 half day sorties out on the river, BRILLIANT! The Giant Otter were also seen on 4 separate trips out on the launches. The birding was grand and filled the time when Jaguars were immobile / resting. Iguassi Falls lived up to expectations, the sight and "roar" was awesome. Eat your heart out Niagara! "